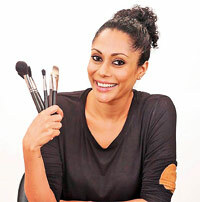 Pallavi Symons, professional make-up artist in India and an expert across international beauty and fashion circuits together with Pond’s BB+, will introduce an exclusive range of new looks for 2016, at the upcoming Colombo Fashion Week (CFW), organizers of the show said in a statement. Symons’ career as a professional make-up artist kick started in 1998, having started out as a model in 1993. Throughout her career, she has maintained a high editorial profile working with many of the top Indian fashion designers including Manish Malhotra. Her masterful make-up artistry earned her a place to work on international projects including the Milan Fashion Week and the Dubai Film Festival with top designers such as Roberto Cavalli, Alexander McQueen and Moschino. In addition, Pallavi has recently collaborated with MAC as a pro artist and is now closely associated with leading conglomerate brands like Unilever and TATA, the statement said. The statement quoted Symons as saying, radiant skin is the key to great looking make-up. Adding that she is excited to partake of the much anticipated launch at CFW.